This is a newly designed full conversion cyborg designed by a small company who has their main offices in the city of Tolkeen. This cyborg design is one of the most advanced cyborg designs built outside the Republic of Japan. 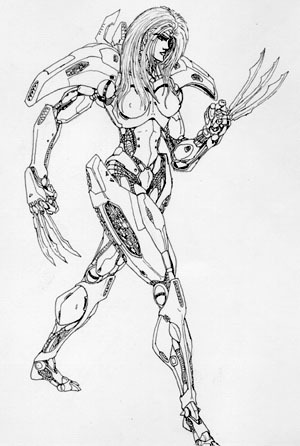 The cyborg was originally designed as a espionage cyborg but the designers designed it with a slightly female form that has evolved into a fully female form and also has become popular with women who have cyborg conversion who wish to keep a female form. The cyborg was designed to have the full protection of a full conversion cyborg but have a reduced weight. The designers have been able to due this by designing the Cyborg frame out of advanced high strength alloys but designing the frame using a honey comb structure. The armor also utilizes the special armor used by the Glitter Boy Power Armor because thinner plates of it can be used while keeping a high protective value. Because the cyborg was designed originally for espionage use, the cyborg only has a 10% prowl penalty. This is due to the lighter weight and due to a special cushioning and shock absorbing system in the feet. The unmodified appearance of the cyborg is silver chrome. This can be changed to a gold chrome with a special coating and a special high temper coating can also be added to change the color to anything desired. For espionage use, the cyborg will normally be either grey or camouflage. The cyborg is also available with a variety of different head styles. A realistic flesh plastic coating can also be added to the face to emulate skin. The designers are considering building a version of this cyborg that looks completely human but in order to reduce the weight, it would have much reduced protective values. The Cyborg listed here is the basic model. Additions in physical abilities are available for extra cost. As well, cybernetic finger Weapons & Equipment and concealed vibro blades in the front of the feet are popular additions to the Cyborg. Because of the slender nature of this cyborg, this body style cannot use standard cyborg armors unless they are specially converted for this design (adds 25% to the cost of the body armor) but instead normally uses normal body armors. While normal body armors are not as strong as Cyborg body armors, they are far quicker to take off and replace and as such have advantages as well. Destroying the head of the cyborg will kill the character! However, the head is a small and difficult target to hit. The attacker must make a called shot and even then is -3 to strike. Depleting the main body will effectively destroy the artificial body, but emergency systems will keep the brain and vital organs alive for 36 hours. Recovery of the severely body will allow doctors to place the organic components in a life support system until the organic components are put into a new cyborg body. If the body take over 100 M.D.C. below zero, the life support systems will fail and kill the organic components. Note: All Cyborg locations are laser resistant. Running: 90 mph (144 kph) without further augmentation. Flying: Borg can be fitted with a Jet Pack that allows flight. Height: 6 feet 4 inches (1.93 m). Physical Attributes: P.S. 26, P.P. 20, P.B. 12, and SPD 132. Laser Beam Eyes (2): Works by looking at the target and a mental command causes the guns to shoot. The laser beam eyes can shoot at any target that can be looked at. The laser beam eyes are either made by Triax or are a knock off copy of those made by the Triax company. Mega Damage: 2D6 for single eye blast or 4D6 per double blast (Both eyes firing at the same time). A double blast counts as one attack. Concealed Vibro-Blades (2): On each forearm is a vibro blade for melee combat. They are made out of a higher density material and the energy field vibrates at a higher speed. Optional Hand Held Weapons: The Cyborg can use most human sized and slightly larger than human sized weapons. These can include rail guns, energy rifles, energy pistols, grenades, and other weapons. Attacks per melee: Equal to player characters hand to hand attacks. Combat Bouses: +6 to initiative, +1 to Parry, +2 to dodge. P.P. 20 bonuses: +3 to strike, Parry, and Dodge. Total Bonuses: +6 to initiative, +3 to Strike, +4 to Parry, +5 to Dodge. This does not include bonuses for skills and hand to hand. These can also be increased by increasing the cyborg's physical prowess. Restrained Punch: 1D6 + 11 S.D.C. Full Strength Punch: 4D6 + 11 S.D.C. Kick: 4D6 + 11 S.D.C. Judo Style Flip/Throw: 3D6 S.D.C. Image drawn and copyrighted by Timothy Leard (rurounichimoshi@hotmail.com) . Copyright © 1998 & 1999, Kitsune. All rights reserved.